Moments later, the pastor drove Templeton to the most exclusive tailor in Dallas to have him fitted for three expensive suits. When Templeton realized what was happening, he protested vigorously, eventually talking the pastor down to a pair of cowboy boots. Templeton had learned through observation and painful experience that lavish gifts come with a price. There was something unusual about the symbiotic relationship between religion and big business in the Dallas of the 1950s and 60s and nothing much has changed. In Nut Country: Right-Wing Dallas and the Birth of the Southern Strategy, Edward H. Miller argues that Big-D was a Beta version for the Southern Strategy, a trial run that worked the bugs out of racial politics. My big question (as the title of this post suggests) is how a fundamentally unchristian political strategy could owe so much to the Christian community. I would argue that the megachurch culture of Dallas has its roots in the strange dynamics Miller describes in Nut Country. 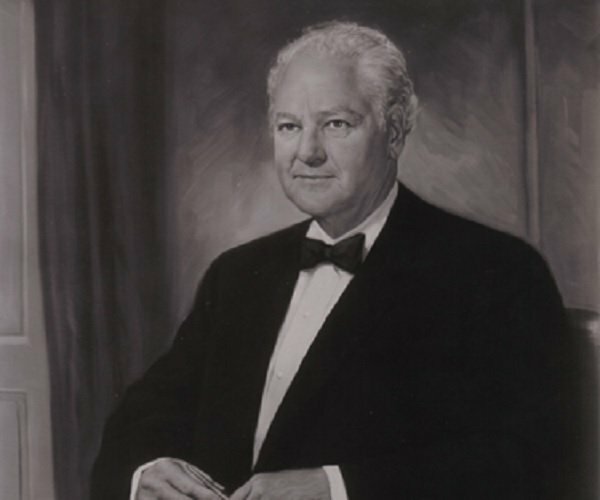 Dallas earned a reputation as “hate city” following the assassination of John F. Kennedy, but Miller detects a method behind the madness. In Dallas, apocalyptic religion, libertarian economics and small government politics were fused into an intoxicating brew that gradually infused and reshaped American politics. The story shows how the central religious tenets of Dallas ultraconservative Republicans advanced their secular political ideology. The Republican Party’s original Southern Strategy was partly grounded in a spiritual defense of segregation, which held that the Bible prohibited the integration of blacks and whites. Biblical literalism and premillennial dispensationalism fostered ultraconservative Republican preoccupation with eschatology and spiritual cabals, which they then projected onto the secular world of politics. This Manichean urge to divide humankind into the children of light and the children of darkness, Miller says, accounts for the vitriolic demonizing of the enemy for which Dallas became infamous. Their embrace of fundamentalism undergirded an absolutist understanding of secular matters, reinforcing their devout belief in the correctness of their opinions and perception of the world as black and white. Their convictions that Satan’s war against Christianity was history’s biggest and longest-standing cabal also likely fed into their preoccupation with conspiracies. For ultraconservative Republicans, history was a grand plot, and conspirators were ubiquitous, omniscient, and omnipotent; random events, when closely scrutinized, were found to fit preconceived patterns that confirmed their conspiratorial worldview. Miller isn’t suggesting that everyone involved in Republican politics shared this ultraconservative worldview, but the extremism on the far right allowed traditional Republicans to stake out exceptionally conservative positions while still appearing “moderate”. W.A. Criswell, the histrionic pastor of First Baptist Church, Dallas, provided a religious grounding for ultraconservative politics. In 1944, Criswell took on the unenviable task of following the irenic, universally respected (and distinctly postmillennial) George Truett as pastor of America’s largest congregation. Truett’s concern for the poor in the heart of the depression was so intense that his wife had to hide money for fear her well-intentioned husband would dispense their entire income to the desperate men and women he encountered on the street. Truett’s sermon’s, Miller tells us, were still being replayed on the radio as late as 1966. Dallas had been an oil town since the 1920s, but the Second World War transformed the city into a hub of the aeronautics industry and people flocked to Big-D from all over the country to get their piece of the pie. The passion for professional advancement encouraged a materialistic, anti-labor, anti-civil rights, pro-business mindset that meshed well with Criswell’s brand of conservatism. Miller gives a great deal of attention to men like H.L. 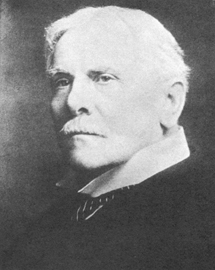 Hunt (reputed to be the richest man in the world) who combined a commitment to laissez faire libertarianism with the dispensational theology he learned from men like Criswell. Hunt invested immense sums in Republican politics, First Baptist Church and Criswell College while building a media empire dedicated to the brand of conspiratorial dispensational libertarianism that, partially thanks to Hunt’s largess, came to typify Dallas ultraconservatism. Hunt created an ideological cottage industry by supporting a vast stable of preachers, pundits and politicians. Did Hunt purchase his own zeitgeist? Not quite, but he came close. Working in a traditionally Democratic section of the “Solid South”, Miller says, Republicans were desperate to shed their image as the Party of Lincoln and Reconstruction. Ultraconservatives embraced the long-standing nineteenth-century notion that the Constitution, rather than providing rights, was in fact designed to restrict them. In this view, the Constitution was intended to protect property rights, safeguard the power of the states relative to the federal government, and curtail democracy in order to preserve the status quo. W.A. 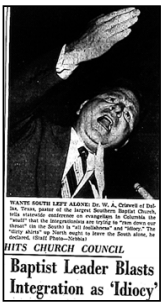 Criswell garnered national media coverage in 1956 by delivering racist diatribes to a South Carolina Baptist Church in the wake of the Supreme Court’s Brown v. Board decision. He argued that segregation was God’s intention and that any deviation from that plan was contrary to the will of God. Integration, he said, was a ‘denial of all that we believe in.’ Ecumenical religious leaders who supported desegregation were ‘just as blasphemous and unbiblical as they can be.’ The ‘universal Fatherhood of God and brotherhood of man’ was a ‘spurious’ doctrine. Republicans are running on a platform of peace. They forget they were born of the most devastating war in our history–the Civil War. When Wade parlayed the travesty in Mansfield into an electoral landslide, Republicans like Bruce Alger were paying attention. After Mansfield, Alger concluded that even in an urban setting as sophisticated and cosmopolitan as Dallas, racial moderation was an untenable position for a Republican seeking reelection in Texas, a state dominated by conservative Democrats. It became clear to him that the citizens of Dallas wanted to keep traditional racial practices in place, and he modified his approach to race-related issues in order to succeed within his political climate. The success of his approach set a precedent for Republicans in the South. But Alger realized that crude attacks on “racial mongrelization” would not work in Dallas. A more subtle approach was needed. 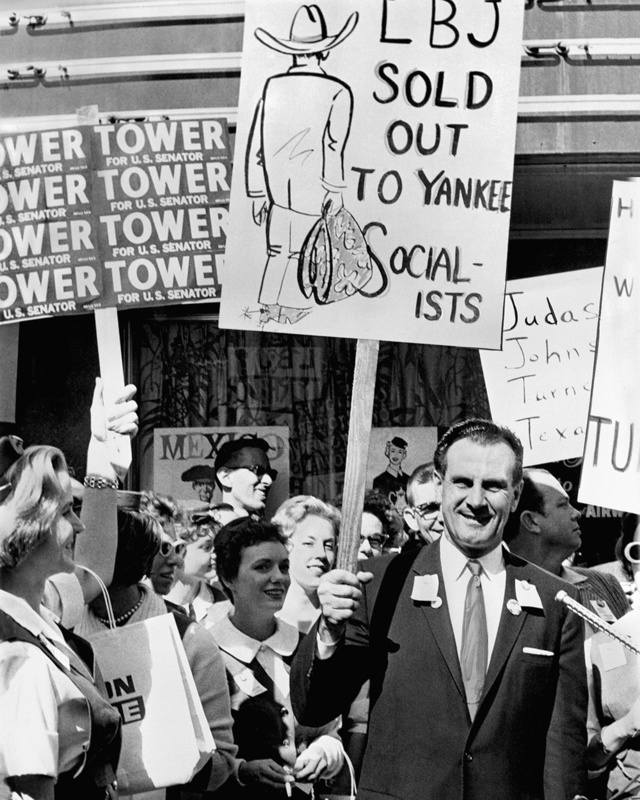 Bruce Alger protests LBJ’s visit to Dallas in 1961. Miller contends that this “understated advocacy of white superiority” established the template used in 1961 by John Tower (the Republican who won Lyndon Johnson’s vacated Senate seat), Barry Goldwater in 1964 and Richard Nixon in 1968. 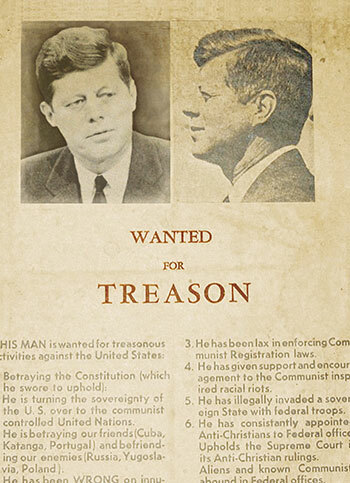 The assassination of John Kennedy proved disastrous for Republicans across the country and the blow-back was particularly severe in Dallas. Alger, the first Republican congressman elected in Dallas since Reconstruction, was defeated in 1964, in part because, in some Dallas precincts, 85% of registered black voters cast their ballots. By 1964, Miller argues, “many Dallas moderate conservative Republicans acknowledged that, at the very least, the party had been on the wrong side of history in the struggle for civil rights.” By the late 1960s, even W.A. Criswell was apologizing for the racial rhetoric that made him a rock star in 1956, going so far as to rebrand First Baptist, Dallas as “the Church of the Open Door”. But with race riots erupting throughout the 1960s, affirmative action programs creating a new species of racial resentment, and Democrats building civil rights into their party platform, Republicans saw a rich opportunity. In disproportion to women and black men, white men had enjoyed, become accustomed to receiving, and used as a springboard to a better life benefits like college education (in many cases financed through the GI Bill). Many were amenable to the argument that affirmative action and other policies threatened their access to these advantages and thus constituted reverse discrimination. Color-blind rhetoric, Miller says, allowed Republicans to argue that America’s debt to people of color had been paid in full, the slate had been wiped clean, and a level playing field was in place. Conservative Republicans in Dallas and nationwide embraced the new color-blind message and co-opted the liberal argument for fairness, contending that affirmative action, public housing, busing, and other products of the 1964 Civil Rights Act denied the civil rights of middle-class white people. Thus while publically promising privileges to all, the color-blind strategy actually protected the benefits already claimed by the privileged. Miller rejects the argument that Democrats and Republicans simply switched places on race in the 1960s. Southern Democrats like George Wallace continued to exploit racial hatred throughout the decade while many Republicans, especially in the North and Midwest, remained racial moderates. On the other hand, there is compelling evidence that the GOP was abandoning, albeit not completely, its heritage as the party of Radical Reconstruction, Abraham Lincoln, and black male suffrage and office-holding. In their campaigns, GOP liberals and moderates never matched the unity and coordination of Republican racial conservatives. Moreover, blacks largely abandoned their support for GOP presidential candidates in 1964 and have never returned to the party. 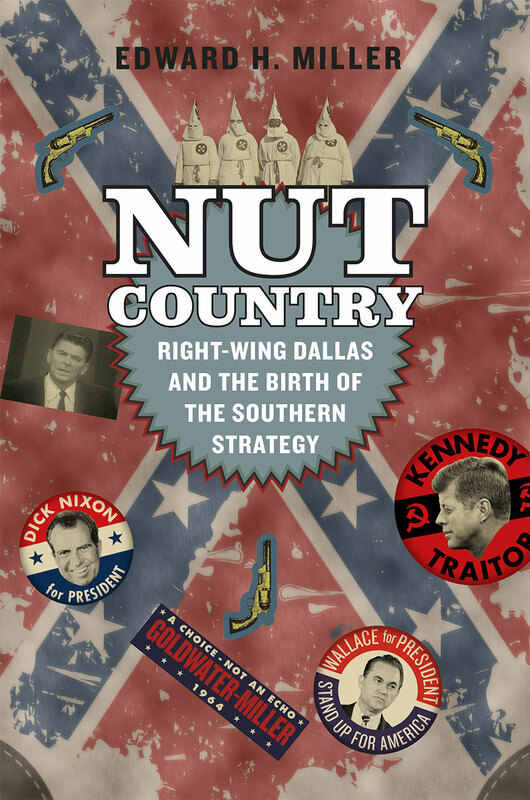 I took the time to read Nut Country because I am mystified by the weird mix of dispensational theology, Randian libertarianism and big business conservatism that continues define Dallas evangelicalism. Dallas has changed dramatically since the 1950s, of course. White residents abandoned Dallas proper for the suburbs for decades until, just recently, the city became a Democratic stronghold. But the megachurches of Greater Dallas carry on the entrepreneurial spirit, the small government politics and the dispensational theology that men like W.A. Criswell put together. Miller tells us that Ayn Rand’s The Fountainhead and Atlas Shrugged were wildly popular in Dallas but Rand’s undisguised hatred for Jesus meant that more academic libertarians like Ludwig Von Mises and Friedrich von Hayek were more likely to be quoted in polite circles. The Pope’s spoken theology is at odds with mainstream Dallas evangelicalism. Miller doesn’t explain how men like H.L. Hunt and W.A. Criswell could square their opposition to racial justice, environmentalism, ecumenism, anti-poverty policies and every other attempt to make the world a more peaceful and harmonious place with their purported commitment to Jesus and his love. So let me give it a shot. The disconnect between Dallas evangelicalism and the teaching of Jesus stands as a weird anomaly until you understand the basic features of premillennial dispensational theology. If you’re familiar with Hal Lindsey’s Late Great Planet Earth or Tim LaHaye’s Left Behind books you have been exposed to dispensational logic. The fundamental idea is that Israel and the Church constitute distinct faith communities. This makes Bible reading tricky because “rightly dividing the word of God” means asking whether the passage in question applies to Israel or the Church. The moral consequences of this Israel-Church divide are troubling. All the talk about justice, caring for the poor, and welcoming the sojourner and the immigrant that we find in the Old Testament apply only to Israel and have no direct relevance for the church. We can profit from reading these ethical injunctions, dispensationalists admit, but they aren’t addressed to us, they’re all about Israel. We’re reading somebody else’s mail. The Church-Israel distinction doesn’t just drive a wedge between the Old and New Testaments of the Christian Bible; it silences Jesus. Traditional dispensationalists teach that Jesus, during the last week of his life, realized that Israel had rejected his offer of the Kingdom. Therefore, during the Last Supper, he shared Plan-B with his disciples. The Church, in Scofield’s view, is an ad hoc community of faith that plays by a new set of rules. Christians are saved by believing Jesus is the Christ, not, as with Israel, through fidelity to the law of Moses. Dispensationalists insist that God’s promises to Israel are eternal and will thus be fulfilled once the church has been conveniently whisked out of the world in the rapture. God will then wreak his vengeance on the world in a literal outpouring of the plagues described in the book of Revelation. Then comes a thousand-year golden age in which the Jewish Law (and the kingdom teaching of Jesus) will once again be operative. But the Israel-Church divide remains in effect because the Church remains in heaven with God throughout the thousand-year millennial reign. Are you following all of this? Southern evangelicalism always hard a hard time squaring Jesus with institutions like slavery and Jim Crow segregation. But, prior to the arrival of dispensationalism in the early 20th century, the inconvenient words of Jesus about radical forgiveness, love of enemies, and the first being last, and God’s preferential love for the poor were either ignored or explained away. The teaching of C.I. Scofield and Lewis Sperry Chafer (the first president of Dallas Theological Seminary) took hold in Dallas because it made it possible for white Christians to affirm an inerrant Bible, profit from the sacrificial work of Jesus on the cross and effectively ignore everything Jesus said in Matthew, Mark, Luke and two-thirds of John. The only words of Jesus that apply directly to the Church, dispensationalists like Scofield taught, appear in the “farewell discourse” in the latter chapters of John’s gospel. If you want to understand the Christian mission, read Paul, Hebrews and Revelation; but the Sermon on the Mount needn’t be taken seriously because, strictly speaking, it isn’t a Christian document. This explains why the ethical thrust of Christian scripture can be blithely ignored while the explicitly Antichrist tenets of Ayn Rand are embraced with an ungodly passion. With Jesus silenced, you may take your moral guidance from anyone you like. It should be noted that the Prosperity Gospel of Kenneth Copeland also has its roots in Dallas, but that’s fodder for another post. Dispensationalists speak of the apostasy (or ‘wreck’) of the Church as a predestined inevitability. The true Church will be caught up in the clouds with Jesus, but most people calling themselves “Christians” (the liberals) will already have deserted to the Antichrist and must therefore undergo the horrors of the seven-year Tribulation. This explains why Republican presidential candidates with an interest in courting the religious right have a hard time stipulating that Barack Obama is a Christian. Obama (and his radical preacher, Jeremiah Wright) are liberal Christians and that means they must be regarded as sons of the Antichrist (I wish I was making this up, but I’m not). The doctrine of the pre-tribulation rapture explains why Dallas ultraconservatives could be so blase about nuclear holocaust, especially in the 1950s and early 1960s. It was taken as established fact that John the Revelator had described (and therefore predestined) a nuclear holocaust and, since God has foreordained that the world must soon perish in fire, it was almost sacrilegious to work for global justice. Evangelism is the Church’s only task; snatching brands from the burning (as D.L. Moody liked to say). It didn’t hurt, of course, that men like H.L. Hunt were spending millions of dollars transforming First Baptist Church in to a fundamentalist Mecca or funding the college that still bears Criswell’s name. While we wait for the trumpet to sound, somebody’s got to pay the bills. If you wanted to get ahead in Criswell’s religious/political culture, Jesus had to be silenced and dispensational theology transformed this necessity into a virtue. The ideas at the root of dispensational dogma allowed religious leaders to embrace Randian economics and pro-business politics with unseemly zeal. Criswell knew full well that Jesus taught a very different ethic from the one he was preaching, but Jesus wasn’t talking to the Church until the fourteenth chapter of John’s gospel. This dispensational “insight” allowed Criswell to proclaim a Christianity largely devoid of the words of Jesus. In the fall of 1976, we moved from St Louis, where we were members of Kirkwood Baptist Church, to Richardson, TX and joined First Baptist Church there. Within a short time, we became aware of a go, go money making attitude of Christians we associated with in the Dallas area. In Missouri, most of our social life was with other members of Kirkwood Baptist Church. At those gatherings, it was common that conversation was frequently about ideas and discussion of books recently read. In Dallas, the difference was striking. At social gatherings of members of First Baptist Church of Richardson, we noted talk of the latest real estate deals, other money making endeavors and about tax shelters. Hovering over all this was the religious reputation and success of Tom Landry and the success and glamour of The Dallas Cowboys. In total, without explicit statements, a pervasive theology hung over the scene of prosperity theology. That theology was openly promoted by a high profile motivational speaker, Zig Ziggler. God favored Christians in business. The success of W A Criswell and First Baptist Church of Dallas reinforced the subtle appeal of prosperity theology. It also favored political candidates who promoted business activity. So much of my life is reflected here. I grew up in Dallas, was in Junior High and standing on a downtown street to cheer just 10 minutes before JFK was shot. Ultimately, the fundamental world sucked me in and I actually earned a degree from Dallas Theological Seminary after they finally started admitted women to their major degree program. It was during intense Bible study there, as I gained fluency in both biblical Hebrew and Greek, that my entire theological world began to fall apart. I saw how many lies it was necessary to tell in order to keep dispensational/calvinist theology intact. I became more and more appalled at the callous treatment of the disenfranchized of society. Ultimately, I was kicked out of that tight and nasty little world by my, to them disgraceful, decision to divorce and leave behind a seriously damaged and dangerous relationship. Oh, Dr. Criswell himself performed my wedding ceremony! Although I do appreciate the depth of my biblical knowledge, I have completely discarded all theological teachings from DTS, earned a D-Min from SMU Perkins School of Theology and was eventually ordained an Elder in The United Methodist Church. I still shudder when I remember the darkness of those days and actively speak out against that type of theological understanding. Christy, thank you for sharing your story with us. I’m glad you were able to land on your feet. Wow! When an entire clan is taught to fear those outside the clan, it becomes very difficult for individuals, even the kindest and sweetest, to value lives on the other side of the wall. Many of these people are remarkably loving to those numbered among the elect, but they don’t even aspire to love the enemy (that is, everybody else). Very thought-provoking. I really enjoyed it and can see my world better. I was born in Shreveport and moved to Texas in 1961 after college. WOW!